CB-50 - NexSens Technology Inc.
With an overall 18-inch diameter by 37.5-inch height, the CB-50 can be deployed quickly and easily from a small boat. Fully configured systems typically weigh around 50 lbs. A removable topside foam tower protects the electronics, supports solar marine lights, and offers a convenient lifting point via (3) 5/8” eyenuts. The 5.5” ID center hole is designed to securely house X2-SDL data loggers. Empty canisters are also available for user-supplied electronics. The X2-SDL is configured with three sensor ports for connection to industry standard communication protocols including SDI-12, RS-485 and RS-232. An optional instrument cage provides a secure mounting location for water quality sensors, multi-parameter sondes, depth sonar and more. The optional solar marine light has a one to three nautical mile range and securely mounts to the buoy top plate for maximum visibility. 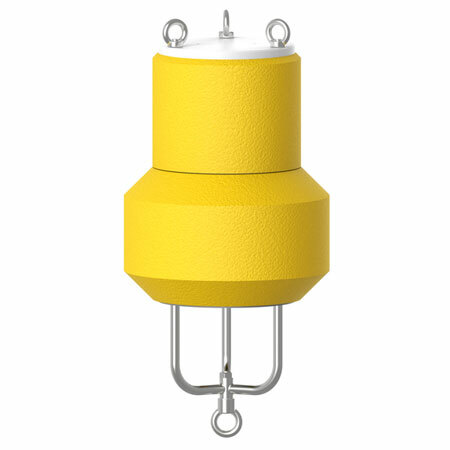 The CB-50 data buoy is designed to accommodate the X2-SDL submersible data logging system, which includes integrated power supply and optional wireless telemetry. The X2-SDL data logger is available with radio-to-shore, cellular and Iridium satellite communications. An integrated antenna mounts securely beneath the tower. Constructed of cross-linked polyethylene foam with a heavy polymer skin and an indestructible stainless steel frame, the CB-50 is designed for years of service.